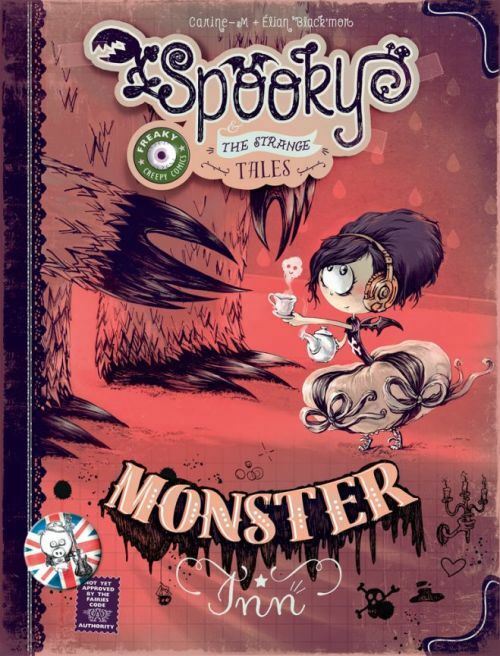 Spooky & The Strange Tales: Monster Inn is a 2017 illustrated story book written and illustrated by the team of Carine-M Black'more and Elian Black'more – authors, illustrators, and concept and graphic designers. This 9” x 11¾” book blends contemporary goth culture and fairy tale tropes and presents it as an over-sized faux diary of written entries, drawings, sketches, and doodles from a girl named Spooky, who is also a princess. Once upon a time in “Fairytale Land,” the king and queen gave birth to the strangest girl child. She was born with skin white as milk and hair black as silk. Her godmother blessed her with the gift of gab and with a very wild imagination. Her name is “Spooky,” and she took a book that was supposed to be a big thick book of fairy tales and turned it into her personal diary – much to the book's chagrin. One day, three royal subjects of Fairytale Land visit Spooky's parents. They are Spooky's uncles, the famous “Three Little Pigs.” They just bought a new gothic inn in London, and they are offering Spooky a trip to visit. There, she will find monsters to meet and mysteries to solve! THE LOWDOWN: I am fascinated by the idea of a book that was supposed to contain fairty tales forced to hold the wisdom of a bratty fairy girl. The bratty girl is a familiar character or character-type, but the taciturn book is something different. The large size of the pages in Spooky & The Strange Tales: Monster Inn allows the authors to fill the pages with illustrations, story and mischief. The Black-mores offer full-page illustrations, doodles, spot illustrations, and drawings that can be described as all of the above. It is a novel idea – a picture book for gothic, ghoulish, and macabre – young and young-at-heart. I READS YOU RECOMMENDS: Fans of gothic storybooks and French graphic novels will want to try Spooky & The Strange Tales: Monster Inn.